Our fourth and last day was exceptional, but we had to pick were we wanted to go. We slept late, so we got up late. Across the street from the hotel is a Donut-Coffee shop. We have gone there the day before and had a nice Latte with a Ham and Cheese Croissant-Sandwich. So here we were again for another round at a local coffee shop. Amazingly that day, we saw something we thought was embarassing to say the least. An american was being rude to a Money Exchange Teller, because he did not want to be charged to buy dollars. To make a long story short what a scene. For Americans to travel to England is not cheap, the dollar was at an old time low almost 50 cents it's value against the English Pound. Imagine to travel across the World, all this way, from United States of America to be so rude, and a jerk, it takes a lack of class, what a waste of airplane space. We decided to go to the coffee shop ahead of schedule and then come back. The Tellerwent out of his way, to give us the change we wanted, even though he had just experienced the other american side of our Nation. We wanted coins, and we wanted 20 pence coins for the public toilets. 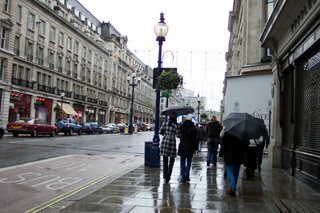 The streets were decorated very nicely, I wish my camera had a better disposition, it was being temperamental with the moisture I believe. As we moved down Regent street we decided to go by the famous Carnaby Street . 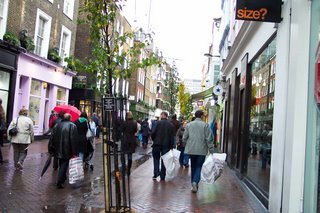 Carnaby Street is a street in London, in the district of Soho, near Oxford Street, and just to the east of Regent Street. 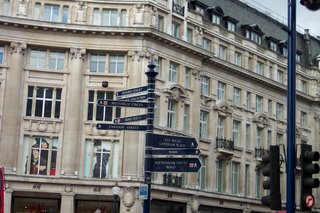 It is named after Karnaby House, a large building located to its east which was erected in 1683. It is not known why the house was so called. The street was probably laid out in 1685 or 1686 and first appears in the ratebooks in 1687. It was almost completely built up by 1690 with small houses. Carnaby Street was made popular by followers of the Mod style in the 1960s, and became closely associated with the Swinging Sixties, when many independent music shops, fashion boutiques, and designers such as Mary Quant were located there. 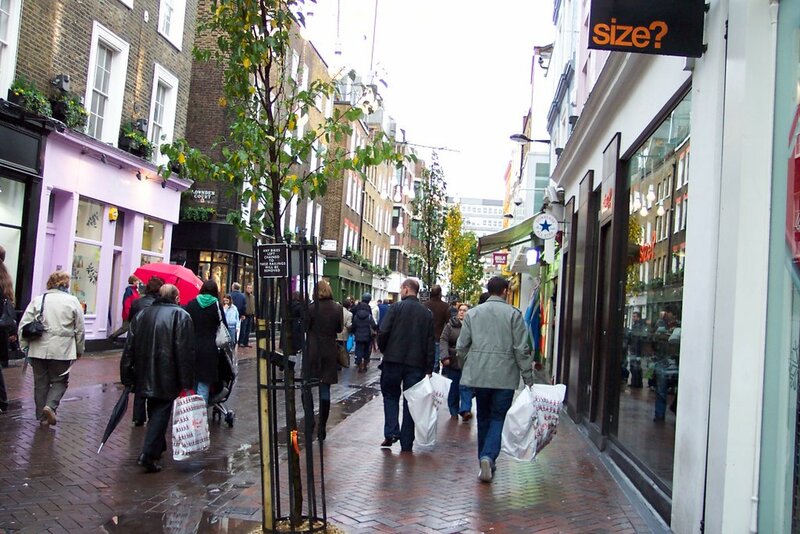 Today, Carnaby Street is more mainstream, being mostly chain stores and restaurants, with few independent outlets, and is popular with young shoppers and tourists. Carnaby Street was also the address of high-profile fashion retailer boo.com from 1999 until its bankruptcy in May 2000. 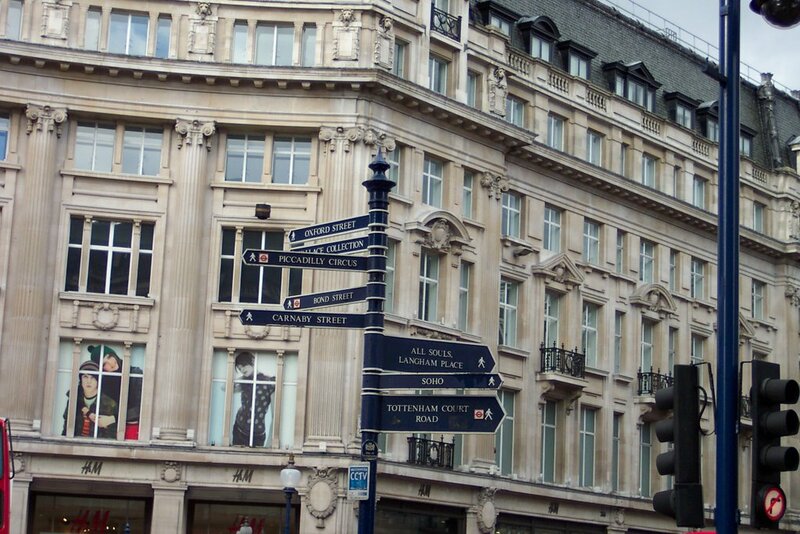 Nearby places of interest include Broadwick Street, where you can see a replica of the water pump that John Snow famously sealed up to stop an outbreak of cholera in 1854; the toy shop Hamleys and the rest of Regent Street; and Golden Square just to the south, which during the summer is crammed with office workers trying to catch the sun. 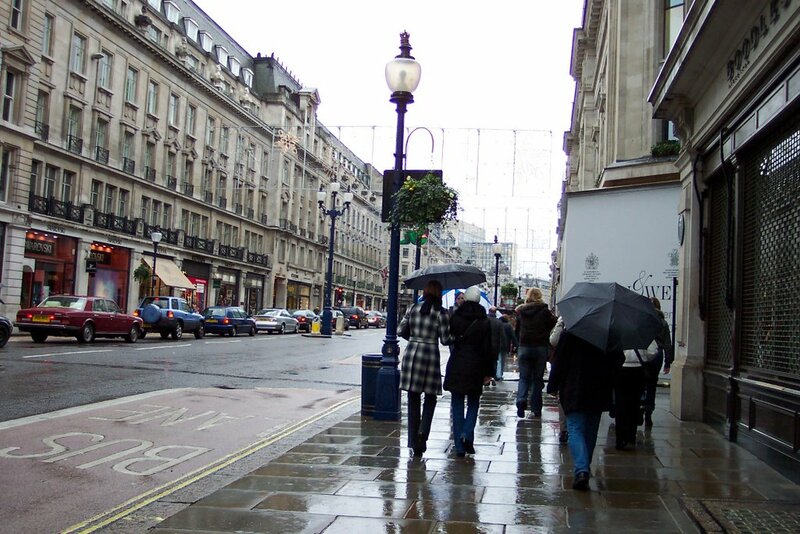 The street and the area surrounding it are partly pedestrianised. I can tell you that there was not enough time for shopping, yet we were able to get some wonderful pashmina scarfs. From here we kept walking until we got to the British Museum. 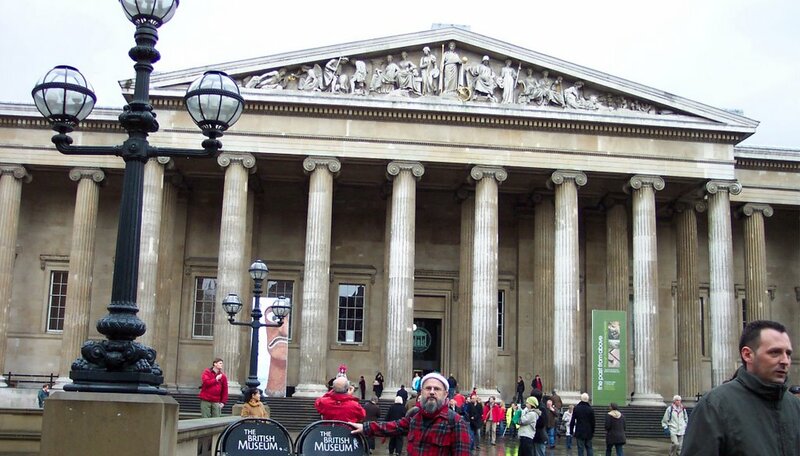 The British Museum in London is one of the world's largest and most important museums of human history and culture. Its collections, which number more than seven million objects from all continents, illustrate and document the story of human culture from its beginning to the present. As with all other national museums and art galleries in Britain, the Museum charges no admission fee, although charges are levied for some temporary special exhibitions. It was established in 1753 and was based largely on the collections of the physician and scientist Sir Hans Sloane. The museum first opened to the public on 15 January 1759 in Montagu House in Bloomsbury, on the site of the current museum building. 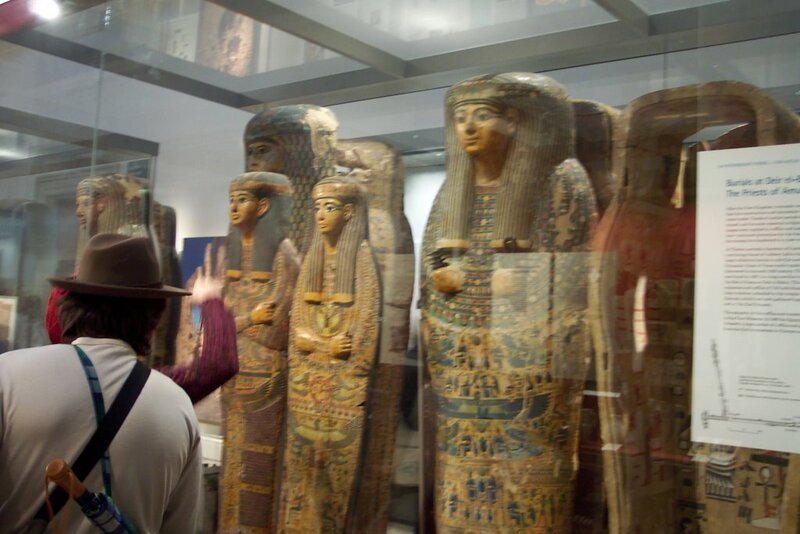 Its expansion over the following two and a half centuries has resulted in the creation of several branch institutions, the first being the British Museum (Natural History) in South Kensington in 1887. 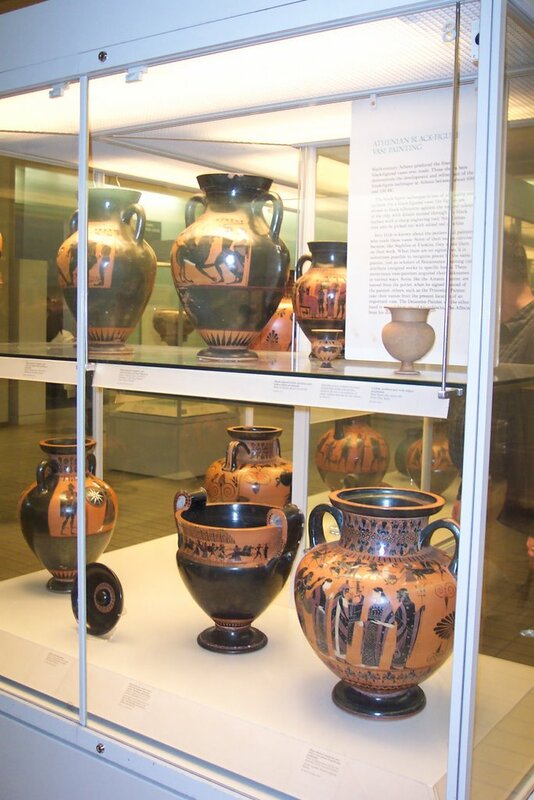 Until 1997, when the British Library opened to the public, the British Museum was unique in that it housed both a national museum of antiquities and a national library in the same building. Its present chairman is Sir John Boyd and its director is Neil MacGregor. In the time that we spent at the Museum we were able to see just part of it. We knew which parts we were going to explore first , just in case we were too tired. Nevertheless were tired, we rested 10 to 15 minutes, then continued our journey through the museum. 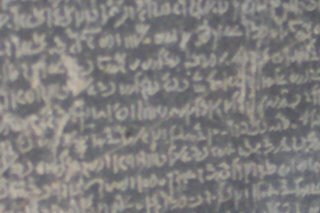 The have a wonderful Egyptian Collection that I am only able to share some pictures of. Here are some artifacts from the Middle East, Mesopotamia. This that you can see is part of the most famous discovery on the world. ons to erect statues in temples. centimeters thick (45.04 in. high, 28.5 in. wide, 10.9 in. thick). Weighing approximately 760 kg (1,676 pounds), it was originally thought to be granite or basalt but is currently described as granodiorite and is dark grey-pinkish in color. 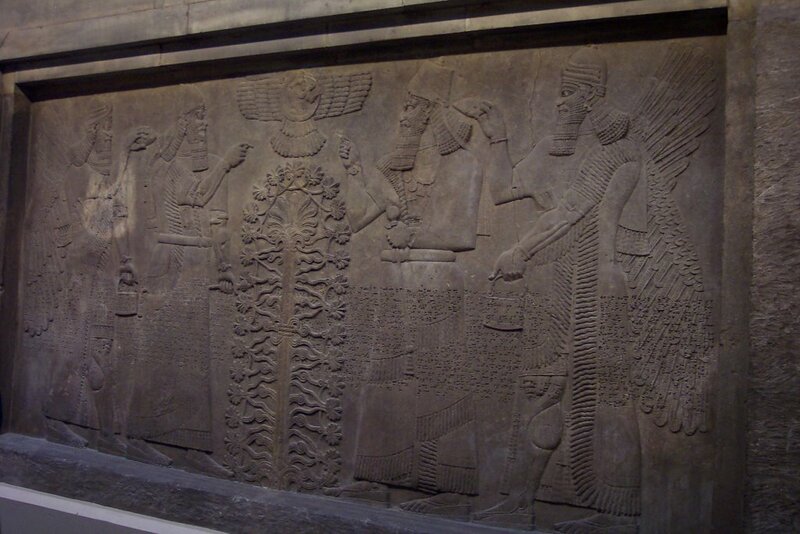 The Stone has been kept at the British Museum in London since 1802. 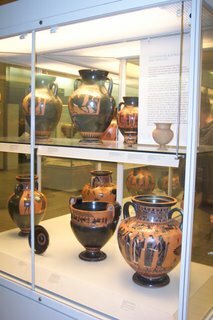 We also saw some of the greek artifacts, ruins, vases, statues, so much to see and little time, so we had to pick our sites well. There were the ruins of a complete temple that was astonishing to see. Just imaging being in the presence of structures of so long ago. I was very honored to be in the presence of such displays of art. 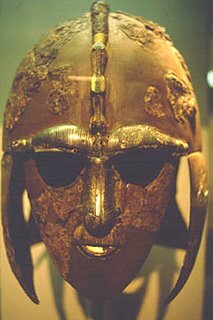 Sutton Hoo, (grid reference TM288487) near Woodbridge, Suffolk, is an Anglo-Saxon cemetery and the site of an early 7th century ship burial. The ship-burial was discovered in 1939 and contained a wealth of artifacts. Sutton Hoo is of primary importance to early medieval historians because it sheds light on a period in English history that otherwise has little documented evidence remaining - it has been called "page one of English history". It is one of the most remarkable archaeological finds in England because of its age, size, far reaching connections, completeness, beauty, rarity and historical importance. We ended the journey at the Museum gift shop. There were a lot of nice souveniers to bring home, including some nice Global DVD's that we were able to enjoy once we were home. You have to be careful when yo buy your DVDs, because if the dvd is not in the NTSC format, you will not be able to watch them on your DVD or your computer, it is the format for North America..
After having a lite lunch at the Museum, we decided to take the train to the London Bridge. 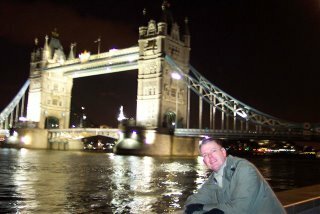 London Bridge is a bridge in London, England over the River Thames, between the City of London and Southwark. It is between Cannon Street Railway Bridge and Tower Bridge; it also forms the western end of the Pool of London. London's original bridge made this one of the most famous bridge emplacements in the world. It was the only bridge over the Thames in London until Westminster Bridge was opened in 1750.
bridge and across the other. and we saw the Tower of London. It was closed, but it was just fun to be there. 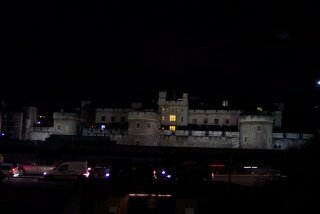 The Tower of London is a dominating landmark in central London—in the London Borough of Tower Hamlets— on the eastern border of the City of London, beside the northern bank of the River Thames. within the outer defensive walls and moat. 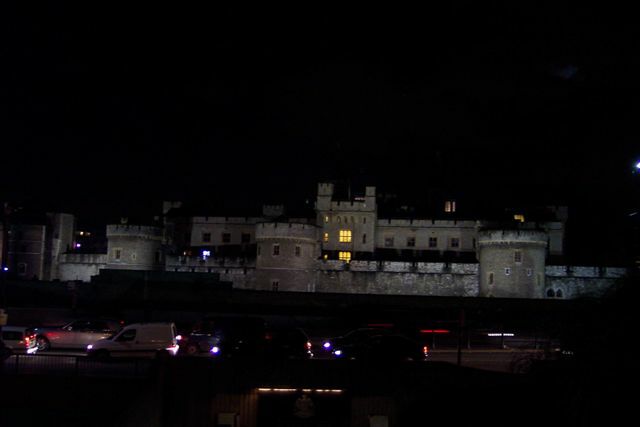 The Tower's primary function was as a fortress, a royal palace and a prison (particularly for high status and royal prisoners (such as the Princes in the Tower and the future Queen Elizabeth I). This last use has led to the phrase "sent to the Tower" meaning "imprisoned". It has also served as a place of execution and torture, an armoury, a treasury, a zoo, a mint, a public records office, and an observatory. So here you got Mike at the bridge, as we were walking back by the New London Bridge, I had to have some of those hot peanuts with toffee that they were selling on almost every corner. to live with a very high standard of living. and visit. The subway system is extraordinary and the amount of people that come in and out of it in such an orderly way, that you don't realize the amount of people it moves in a day. 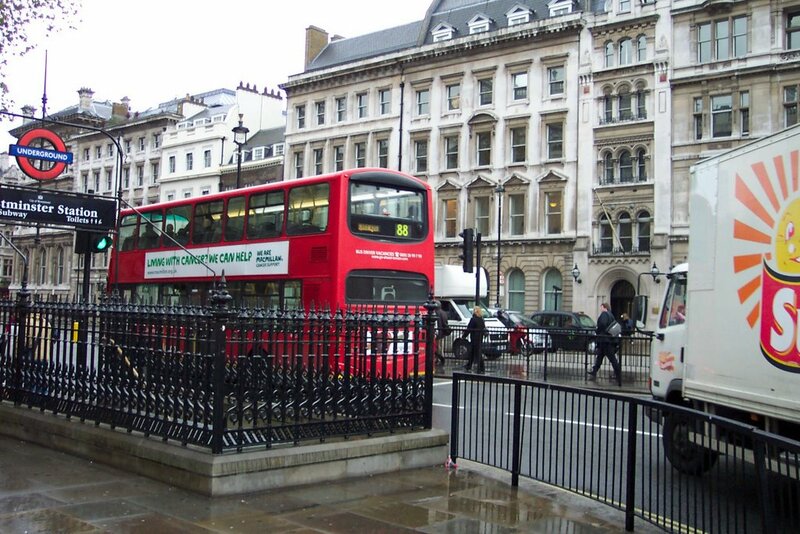 In all the time we were in London we never had the need to ake a taxi or a bus. The London Underground is an all electric railway system that covers much of the conurbation of Greater London and some neighbouring areas. It is the world's oldest underground system, and is the largest in terms of route length. Service began on 10 January 1863 on the Metropolitan Railway; most of that initial route is now part of the Hammersmith & City Line. Despite its name, about 55% of the network is above ground. Popular local names include the Underground and, more colloquially, the Tube, in reference to the cylindrical shape of the system's deep-bore tunnels. The Underground currently serves 274 stations and runs over 408 km (253 miles) of lines. There are also a number of former stations and tunnels that are now closed. In 2004–2005, total passenger journeys reached a record number of of 976 million, an average of 2.67 million per day. 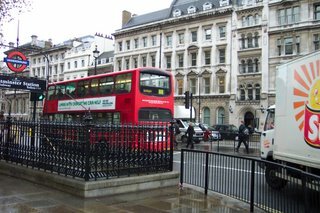 Since 2003, the Underground has been part of Transport for London (TfL), which also administers Greater London's buses, including the famous red double-deckers, and carries out numerous other transport-related functions in the region; as London Underground Limited it was previously a subsidiary of London Regional Transport, a statutory corporation. Very cosmopolitan city with many cultures that mingle nicely. I want to thank you for your attention and for stopping by. This concludes my trip to London. I have fulfilled one of my life's dreams. Now let's go back to some crochet and kniting.